News from Vietnam: Kinderstern e.V. The burocracy of the Saigoner social- und planning department remains a constant challenge to our patience. During the almost 30 years of humanitarian work I experienced it in no country to be more difficult than in Vietnam to build an orphanage. Even using the term „orphanage“ is here a ta-boo. Since 2008 we are seeking to acquire a property or a building as a permanent residence for our pro-tigees. Thanks to Carmen Knoebel, the Kinderstern and their Sponsors, this projekt can be finan-ced, and hopefully realized this year. The property on sale is perfectly suited for an orphanage. The 400m2 large site consists of a buil-ding with meadowland, and is located in the immediate vicinity schools and markets. Complete renovation and reconstruction of the site is necessary. In order to provide space for the 42 orphans and street urchins a two storey reconstruction plus an attic is planned. The building is designed to harbour enough space for various purposes, such as shower rooms, laundry facilities, for example, enabling the children to do their own laundry, as they already do. The authoritites ask for a statistical construction expertise, before permitting the re-constrcuction of the building. After this being issued, we will personally submit the expertise plus the constructiuon blueprints to the health, social and planning department. I therefore explained brother Jerome that the certification of the contract and the re-construction of the property will start after all questions are resolved and a written permit from the proper authorities is issued. We accomplished 710 cardiac operations until today This is god news for all sponsors. Most of these children, who are between 4 months and 15 years of age, wouldn`t be alive today if there havn`t been this, often last minute rescue The energy and joy of life these children radiate, witnes-sing their well being and happiness, this impressed our team the most. We were simply moved, and experienced one of the happiest moments next to all the grief and sorrow we encountered. But I want and I have to report this as well. Three days after my arrival in Vietnam I am driving with my team, this is brother Jerome, father. Paul, Vu Quy Phuong, Mrs. Lien, Mrs. Thi Hong and the driver Tai Nguyen, for 4 days in the pro-vinces of Dong Thap,Tien Giang and Vinh Long, to visit 24 cardiac diseased children. Again, we encounter the poorest among the poor. The children we visited were chronically mal- and under nourished. The medical Checkup of the children at the Trieu An Hospital was conducted on June the 24. The diagnosis of Dr. Phan was that of 24 checked children, 10 couldn`t be operated on anymore, and their life expectation is limited. We were shocked and deeply moved. During these days I ask mysealf of how much one endure such emotional and physical strain. If I didn`t experience, next to all these sad and sorrow moments, wonderful moments of hope, I would have given up long ago. 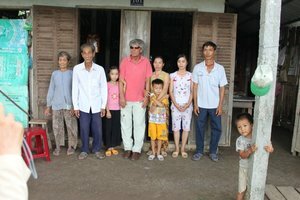 The next day we visited the four year old girl Huynh Thi Diem My and her famely in Tien Giang. In February 2008 Carmen Knoebel, her daughter Stella and her grandchild Lola had already paid the famely a visit. My was then to weak and malnourished for a heart surgery. Februar 2010 Reda El Sherif, Claus Ruff und his Team paid My another visit. It was then that I de-cided to replace their depilated wooden shackle home, covererd with rugged plastic sheets with a new house. Initially I came to to see My finally being operated on. Also I wanted to hand over the completed construction of My´s new home. But I found My and her mother under tears, telling me that My cannot be operated on anymore, and, in foreseeable future, is going to die.